1. Place the tea bags into a large heatproof jug and pour over one litre of boiling water and leave to brew for three minutes. Remove the tea bags, leave to cool then transfer to the fridge to chill. 2. 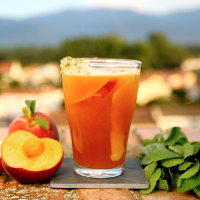 Once the tea is chilled, stone and roughly chop two of the peaches, transfer to a liquidiser and blend until smooth. Top up the jug of tea with ice cubes then strain the peach purée through a sieve into the tea. Stir to combine. 3. Grind the sugar and mint leaves in a mini food processor or pestle and mortar until fine, then tip into a bowl. 4. Stone and slice the remaining peach and rub a slice around the rim of each glass then dip into the mint sugar. 5. Using a potato peeler, peel four strips of lemon zest and add one to each glass. Top up with the peach iced tea and garnish with peach slices.